Forecast Office Section, At 6am Thursday 17th August 2017. 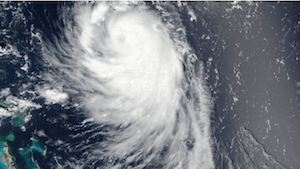 At 5:00am Edt, The Center Of Hurricane Gert Was Located Near Latitude 41.7°north And Longitude 54.0° West Or About 350 Miles South Of Cape Race Newfoundland Or 525 Miles East-southeast Of Halifax Nova Scotia. Hurricane Gert Is Moving Toward The East-northeast At 39 Mph And This Motion Is Expected To Continue Today. A Slower Northeastward To East-northeastward Motion Is Expected On Friday. Maximum Sustained Winds Have Decreased To Near 100 Miles Per Hour (Mph) With Higher Gusts. Continued Weakening Is Forecast, And Gert Is Likely To Lose Its Tropical Characteristics By Tonight.